Fire Doors and Frames | Adams Fire Tech (Pvt) Ltd.
As part of our continuous strive for innovation, Adams Fire Tech has launched its world class fire resisting doors and frames operation. The fire doors and frames are manufactured in a totally automated plant which employs computer numerical controlled (CNC) machines and thus ensures uniform quality and superb finish. 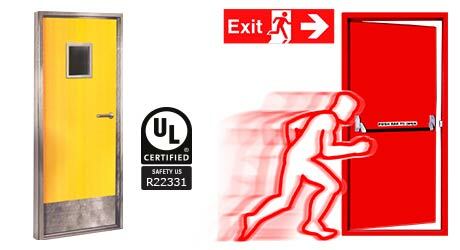 Adams Fire Tech fire doors are manufactured to comply with various architectural requirements. 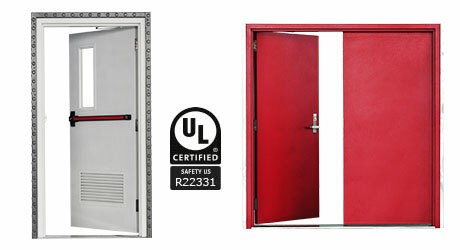 Adams Fire Tech’s fire rated doors are made of Cold Rolled Steel, Galvanized Steel, or Stainless Steel. These doors are designed for areas where strength, stability and durability are priority. Typical applications include entrances to industrial premises, to shops service doors, to basements, to stairs wells and to elevator shafts. They are also widely used as dividing or external doors in electrical and petrochemical plants.